There’s no way around it: 2015 is a big year. From major elections to historic summits of world leaders, there are a lot of important moments to watch out for around the globe. Africa, in particular, is set to have an eventful year. But some of the most important issues and events happening on the continent in 2015 may not be familiar to US audiences. Youth in Tanzania joined forces on Jan. 15 as part of the action/2015 coalition, which aims to end poverty and inequality. This month, the Brookings Institute’s Africa Growth Initiative helpfully identified what it considers to be some of the top priorities for Africa in 2015. Their report, called Foresight Africa, lists a wide range of issues, from Ebola to the African Union to US-Africa relations. Though each African country is unique and will have its own set of opportunities and challenges in 2015, the list provides a very useful context for the year. Africa simply doesn’t get enough air time in the United States. Think about it: one of the biggest news stories out of Africa last year was Oscar Pistorius’ murder trial. Given the other things happening in Africa that were more impactful on a global scale…this is really emblematic of the challenge we face. There just isn’t as much of a focus on Africa as their needs to be. More than a dozen African nations will conduct elections in 2015, including Nigeria, the continent’s largest country in terms of population and economy. As the Brookings report notes, some African nations are only recently transitioning to democracies, so 2015 has the potential to yield cause for celebration. On the other hand, the report cautions that countries must ensure their citizens feel elections are free, fair and credible—which shows how important transparency and good governance will be in 2015. The Ebola outbreak in West Africa was a dominant news story in 2014. While the number of new deaths is decreasing, there is still a lot of work left to do. Vera Songwe, a Brookings fellow, spoke at last week’s panel about the continent’s need to rebuild and strengthen health systems, as well as deal with the spillover effects the outbreak has had on economic activity. According to Songwe , improved international funding for the crisis will also be critical in 2015. “As we speak, there is a clear downward trend for Ebola, but we are still looking at a huge fiscal gap for funding this,” she said. Want to learn more? You can find out which donors are keeping their commitments by using ONE’s interactive Ebola Response Tracker. Despite news coverage to the contrary, the Brookings Institute report argues that violence across the continent is decreasing—but it will take renewed efforts to continue this trend in 2015. “On balance, Africa is doing gradually better in development terms. But that’s a gradual trend line, and unfortunately I don’t think we are doing enough, fast enough,” said Michael O’Hanlon, the Director of Foreign Policy Research at the Center for 21st Century Security and Intelligence, who co-authored this section of the Brookings report. He identified bright spots in his predictions for 2015, like fewer instances of civil war and “success stories” like Somalia. But he also cautioned that challenges such as Boko Haram in Nigeria and high crime rates in many countries leave a lot of work to do for peacebuilding this year. 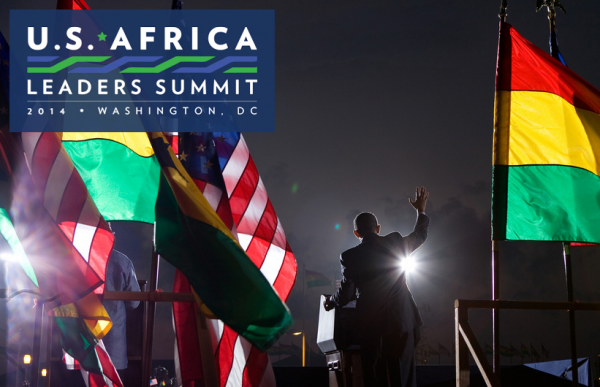 2013 and 2014 were historic years for US-Africa relations. Highlights included the launch of initiatives like Power Africa and the Young African Leaders Initiative, as well as the first ever US-African Leaders Summit, which brought 50 African heads of state to Washington, DC. You can delve into the rest of the Brookings Institute’s report here. What else do you think should be a top priority for Africa in 2015? Tell us in a comment below! If you want to be part of the big things happening in 2015, join us and make your pledge to demand a better world.